A two stroke cycle engine has twice the number of power strokes than the four stroke cycle engine at the same engine speed. For the same power developed, a two stroke cycle engine is lighter, less bulky and occupies less floor area. 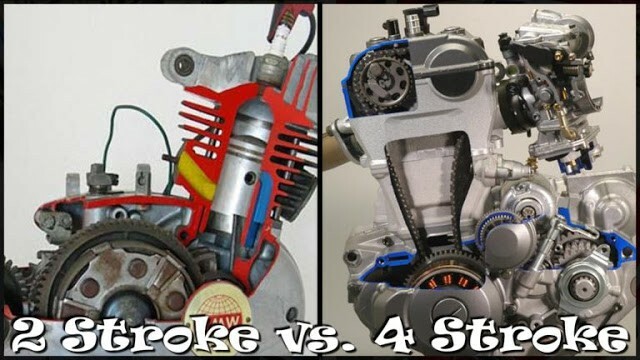 The weight of the two stroke engine is less than four stroke cycle engine because of the lighter flywheel due to more uniform torque on the crankshaft. Since there are only two strokes in a cycle, the work required to overcome the friction and the exhaust strokes is saved. It has no valves, so complicated valve actuating mechanism not required. It has few moving parts, so compact and simple construction. No oil sump for lubrication. Petroil is used for lubrication so it can be used in all positions. The work required to come over the friction of suction and exhaust is saved. As there is a power stroke in every revolution, the turning moment is uniform. Light flywheels are required. Incomplete combustion, carbon deposit on the piston head and exhaust port. Less efficient in terms of fuel economy due to part of the unburned charge is rejected during transfer phase. More wear and fragile than the four-stroke engine. Shorter life span. They are liable to cause high consumption of lubricating oil. Worst hydrocarbon emission rate. High polluting. High vibration and noisy operation. Less thermal and volumetric efficiency. Narrow power band compared to a four-stroke engine.